WASHINGTON (AP) — The White House asserted Sunday that a "common-sense test" dictates the Syrian government is responsible for a chemical weapons attack that President Barack Obama says demands a U.S. military response. But Obama's top aide says the administration lacks "irrefutable, beyond-a-reasonable-doubt evidence" that skeptical Americans, including lawmakers who will start voting on military action this week, are seeking. "This is not a court of law. 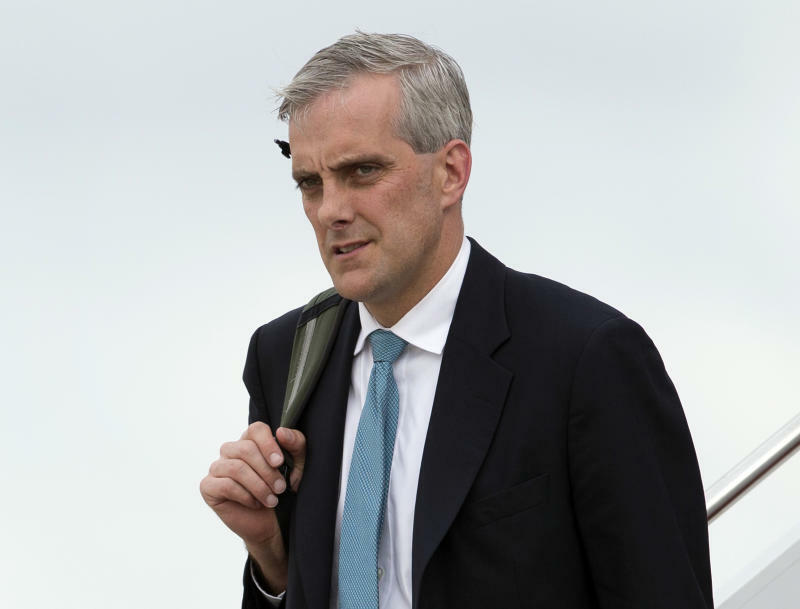 And intelligence does not work that way," White House chief of staff Denis McDonough said during his five-network public relations blitz Sunday to build support for limited strikes against Syrian President Bashar Assad. Asked in another interview about doubt, McDonough was direct: "No question in my mind." The number is higher than that, said Khalid Saleh, head of the press office at the anti-Assad Syrian Coalition, who was in Washington to lobby lawmakers to authorize the strikes. Some of those involved in the attacks later died in their homes and opposition leaders were weighing releasing a full list of names of the dead. The Britain-based Syrian Observatory for Human Rights, which collects information from a network of anti-government activists, says it has so far only been able to confirm 502 dead. In an interview Sunday, Assad told U.S. journalist Charlie Rose there is not conclusive evidence about who is to blame for the chemical weapons attacks and again suggested the rebels were responsible. From Beirut, Rose described his interview, which is to be released Monday on the CBS morning program that Rose hosts, with the full interview airing later in the day on Rose's PBS program. Asked about Assad's claims there is no evidence he used the weapons, Secretary of State John Kerry told reporters in London: "The evidence speaks for itself." Sunday night, Obama dropped in on a dinner held by Vice President Joe Biden for Republican senators, including Lindsey Graham of South Carolina, Susan Collins of Maine, Kelly Ayotte of New Hampshire and Bob Corker of Tennessee. Obama will meet with Senate Democrats Tuesday, a Senate aide said, speaking on condition of anonymity because he was not authorized to publically discuss the meeting before its official announcement. Obama faces a tough audience on Capitol Hill. A survey by The Associated Press shows that House members who are staking out positions are either opposed to or leaning against Obama's plan for a military strike by more than a 6-1 margin. Added Rep. Loretta Sanchez, D-Calif., "For the president to say that this is just a very quick thing and we're out of there, that's how long wars start." Almost half of the 433 House members and a third of the 100-member Senate remain undecided, the AP survey found. Two seats in the 435-member House are vacant. "Just because Assad is a murderous tyrant doesn't mean his opponents are any better," said Sen. Ted Cruz, R-Texas. But some of Assad's opponents are pleading for aid. "The world is watching, and Syrians are wondering: When is the international community going to act and intervene to protect them?" said Saleh. On Saturday, a U.S. official released a DVD compilation of videos showing attack victims that the official said were shown to senators during Thursday's classified briefing. The graphic images have become a rallying point for the administration. Sen. Dianne Feinstein, D-Calif., chairwoman of the Intelligence Committee, also posted videos on the committee's website. But McDonough conceded the United States doesn't have concrete evidence Assad was behind the chemical attacks. Recent opinion surveys show intense American skepticism about military intervention in Syria, even among those who believe Syria's government used chemical weapons on its people. "It's an uphill slog," said Rep. Mike Rogers, the Republican chairman of the House Intelligence Committee who supports strikes on Assad. "They do not dispute the intelligence when we speak with them," McDonough said of members of Congress. But while the public discussion lacks a direct link between Assad and weapons, the private briefs are no better, two lawmakers said. Rep. Buck McKeon, R-Calif., said, "They have evidence showing the regime has probably the responsibility for the attacks." But that's not enough to start military strikes. "They haven't linked it directly to Assad, in my estimation," said McKeon, chairman of the House Armed Services Committee. The material was delivered by "rockets which we know the Assad regime has and we have no indication that the opposition has." Congress resumes work Monday after its summer break. Obama's national security adviser, Susan Rice, plans to discuss Syria in a speech Monday at the New America Foundation and later meet with members of the Congressional Black Caucus. Bipartisan, classified briefings for Congress are set for Monday and Wednesday. Obama planned to address the nation on Tuesday ahead of Wednesday's first showdown vote in the Senate over a resolution that would authorize the "limited and specified use" of U.S. armed forces against Syria for no more than 90 days and barring American ground troops from combat. A final vote is expected at week's end. McDonough spoke with ABC's "This Week," CBS' "Face the Nation," NBC's "Meet the Press," CNN's "State of the Union" and "Fox News Sunday." McCaul and Sanchez were on NBC. Cruz appeared on ABC. Rogers and Amash spoke to CBS. Paul was interviewed on Fox. McKeon was on CNN. Associated Press writers Deb Reichmann in London and Jim Kuhnhenn in Washington contributed to this report.